This luxury camping site is located in Sant Antoni de Calonge, Costa Brava, on the northern coast of Spain. Eurocamping combines the best of two worlds: the conveniences of an urban setting and the tranquility of a natural park environment. A miniature train shuttles campers to and from the beach, which is located 300 metres away. The extensive Aquatic Park and organized activities will keep the kids happy while you join in a choice of fitness classes. Luxury camping begins at the interactive Aquatic Park, which forms the heart of Eurocamping. For added camping luxury, the Aquatic Park also contains an indoor fitness centre with training equipment. A spacious and comfortable mobile home can accommodate the most active of families. Book your stay with LuxCamp and start planning your holiday! 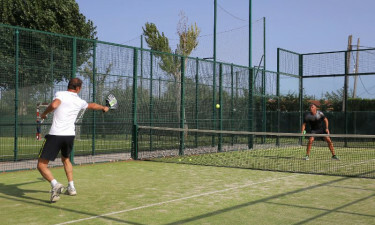 Eurocamping has activities to suit a range of fitness levels. Here are a few features you won’t want to miss. You can keep an eye out for the smaller campers in the paddling pool from the vantage point of your deck chair. 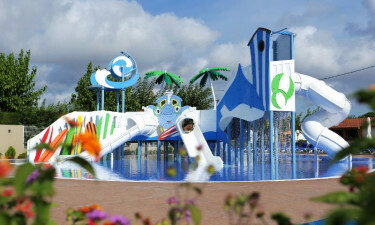 A second children’s pool is packed with fun water slides and fountains. A third and larger swimming pool has an attached spa area with a Jacuzzi and water jets. Even getting to the beach is entertaining. The gaily painted Little Train shuttles guests to and from the beach with lots of room for everyone. The beach area forms part of a well-developed resort strip.